The MediaPad M5 Pro is a tablet that promises a lot, but doesn’t quite deliver on its name. Speaker and button placement is odd, while watching content is hindered due to the screen's outer layer making things fuzzy and apps/software lacking output quality. For creatives, however, the inclusion of the M-Pen stylus at a sensible price point makes it a great buy. 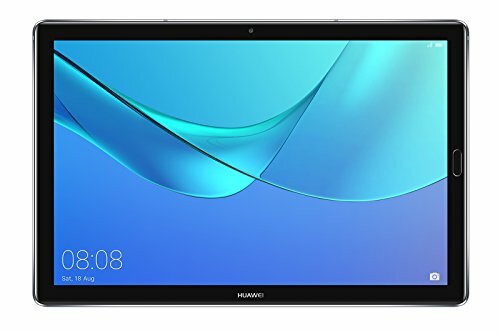 Huawei is gaining ground in the smartphone market, and as we've discovered with the 8.4-inch MediaPad M5, it's focused on ensuring its tablet offerings remain competitive too. While that smaller model is a genuine iPad Mini competitor, the larger MediaPad Pro is gunning to take on Apple's 10.5-inch iPad Pro. For starters the Huawei is about £100 less, includes a stylus in the box and 4G support. But can it offer a truly "pro" experience as its name suggests, without any compromises? We like the smaller 8.4-inch MediaPad's design, but the larger 10-inch Pro model design is a little more puzzling due to the position of the power and volume buttons. It sounds like a small thing, but hear us out. In landscape mode, holding the M5 Pro with the front-facing camera on the top and the fingerprint sensor on the right, the volume buttons are on the right edge towards the top - which is no bother. But switch to portrait and the issue is painfully clear. With the fingerprint sensor at the bottom, these buttons sit on the bottom edge, which means it's very easy to accidentally press them against your thigh/torso, locking the tablet or changing the volume. It also means it's stupidly inconvenient to reach them when you actually want to. Why they're not on the right edge (in portrait) is beyond us. Being a device with a 16:10 aspect ratio display also means the M5 Pro is quite long. It feels a bit awkward to begin with if you're used to the more square 4:3 aspect ratio displays, but soon becomes second nature. Another positional issue is with the tablet's speakers. The long row of machined holes up both sides house four speakers for wide, stereo sound. But like the button positions, the speakers run along the top and bottom of the display in landscape orientation, which means you don't get much of a stereo effect at all. Despite this, the four speakers combined offer a loud and clear sound that you won't find on many other tablets. That means - from and audio perspective - watching music videos or movies is a brilliant experience most of the time, although a little more bass wouldn't go amiss. It might sound like we're all criticism, but we can't fault the build quality or trim of Huawei's tablet. The bead-blasted anodised aluminium chassis feels reassuringly solid in the hand, while the curves towards the edges and at the corners make it ergonomic and pleasant to grip. In that regard it's a thumbs up. We've already mentioned the screen briefly, which offers a good experience overall. Give or take 15 pixels per inch, the MediaPad Pro offers practically the same sharpness as Apple's award-winning 10.5-inch iPad Pro. It's clear from the outset that this is Huawei's answer to that tablet, in Android form. The MediaPad's colour saturation is pleasant, while its brightness gets to a good level - making the panel really vivid and attractive in most instances. Sadly, however, the touch-sensitive layer on the top is so dense - to make it compatible with the included active stylus - that it adds a fuzzy/textured layer to everything. This created slightly rough edges around fine text and app icons on the screen that we found a little difficult to ignore. As for video content, you'd assume this 10.8-inch display is perfectly sized for streaming your favourite movies. Sadly, it's got some problems. The biggest disappointment isn't related to Huawei's hardware, but down to the more popular Android streaming apps. Netflix and Amazon's video quality in the highest available setting on the app was always jagged and often showed weird artefacts around fine text and edges. What's more, these apps weren't very bright, and sometimes hard to watch even with the screen at maximum brightness. We tested the little-known Filmstruck app, and the streaming quality was no better on that. Having content downloaded onto the device wasn't any better either. We're unsure if Huawei's hardware is limiting the streaming quality of the apps. In Netflix's case, it's almost certainly a certification issue. That service is still only available in Full HD on a relatively small portfolio of Android tablets. Whatever the reasons for the others may be, it's a shame that the one thing you'd likely use this screen for most, it isn't that good at handling. In contrast, YouTube displayed perfectly well, providing we choose the highest resolution setting manually on the video we were watching. Thankfully, games also played as well as you would hope on a 280ppi panel. The Pro model of Huawei's latest MediaPad comes with the ability to use an active stylus, called the M-Pen. Think of this more as something similar to the Surface Pen that comes with Microsoft's 2-in-1s than an Apple Pencil lookalike. To optimise the tablet for its use there's an additional interface in the software that converts any handwriting into text. In our experience, even with our terrible handwriting, the software did a really good job of translating scribbles to actual words. For that, Huawei must be applauded. As for drawing and sketching, there are plenty of compatible apps available on the Play Store. We used Autodesk Sketchbook and Adobe Draw, both of which function really well. With the included stylus' nib being so small, it's easy to be accurate, especially with the ability to zoom in and out within the apps. In fact, we'd argue that the pen, coupled with these creative apps, makes the MediaPad Pro a very compelling tool for artists. There is a little lag - only a fraction more than we've seen with the Apple Pencil - but it's not at all off-putting. Perhaps the one downside to the stylus design is that we'd regularly click the physical buttons on the M-pen accidentally - which would either undo what we last did, or launch selective screenshot. In addition to the M-pen, there's a connector point for keyboard docks, which will eventually allow you to attach a physical keyboard. Sadly, at time of testing, there wasn't one available, nor does the forthcoming product even have a name just yet. For the most part, the MediaPad M5 Pro performed just fine. Switching between apps, dropping down the notification layers, and so forth, was all responsive enough during testing. But, again, it's not quite perfect. We often found the bottom portion of the screen would black out momentarily when rotating between portrait and landscape mode. And to tag along with the other video performance quirks, viewing a video in widescreen seemed to render the touchscreen unresponsive at odd intervals. We had to try many times to swipe down the notification shade to adjust the brightness, for example. Like the smaller 8.4-inch MediaPad M5, the 10.8-inch model's standby battery time is fantastic. Meaning, you can leave it doing nothing for a few days and not have to worry. In real-world use, we achieved anywhere between seven to eight hours of actual use before killing the battery, which isn't at all bad. Obviously, more intensive tasks will drain it quicker. What's more, since one of Huawei's fast-charging adapters is in the box, you won't have to wait an age to rejuice. It doesn't achieve sub-90 minute charging times like a smartphone, given the larger battery capacity, and you'll likely still want to leave it plugged in overnight to get it fully topped up. Still, an hour connected to a power source is enough to give you a few hours more use, which is super handy in a device this size. Due to Huawei's EMUI 8.0 software reskin over Google's Android operating system, over a quarter of the 64GB internal storage is used up with pre-installed apps (there are over 50 of them) before you even begin using the tablet. Some you can delete, others you can't. Cameras on a tablet shouldn't be too harshly criticised, given that's not the device's primary use. Apart from maybe the iPad Pro, it's rare to get one that's good enough to compare with a smartphone. It's no surprise, then, that the 13-megapixel camera on the back of the MediaPad M5 Pro is just okay. Take photos in decent amounts of light and they look good enough to share with your friends on social media. They're not the sharpest or most vibrant shots ever, appearing a little fuzzy. In contrasting light conditions things get worse, as photos tend to show up massively overexposed areas, while detail lacks. Still, it's not a camera you're going to be using that often for "proper picture-taking", so for the odd video chat or snap here and there, it'll serve you just fine. Some design choices are meddlesome - such as button and speaker placement - while our video streaming quality issues were jarring. But this is less a tablet for watching content, rather one for creatives who want to scribble, draw and create using the included M-Pen stylus. All while on the go, too, thanks to 4G/LTE cellular connectivity. As an Android competitor to Apple's iPad Pro there's certainly appeal here, not least the price point, which undercuts Apple by around £100. It's just a shame there's no keyboard dock yet or smoother software functionality to truly elevate it to its "Pro" name potential. Although it shares a name with the MediaPad, the iPad Pro is still in a league of its own. But then, it is quite a lot more expensive. The 110Hz display is super smooth and beautiful to look at, while the experience of using the Apple Pencil is also smoother and more responsive. There's also the issue of the App Store, which still holds far more quality tablet-optimised apps than Android. It's not as high-power as the MediaPad M5 Pro, its screen isn't as sharp, nor its design as premium, but the Lenovo does cost considerably less. If you're after an Android tablet with a 10-inch screen without breaking the bank then this is a safe bet.